I haven't created a Tilda card in ages. 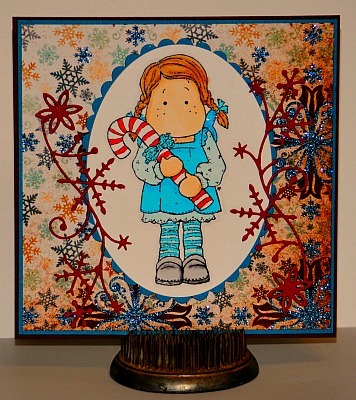 It was so nice to pull out a Tilda stamp and create with her. I got this great paper at my LSS this weekend....Bo Bunny I think. It's full of sparkles and teal and brown--all my favorites. I also got to use my new memory box die..woohoo! Love that memory box die Janet, gorgeous card! Thank you for playing our challenge! I love Tilda- & yours is adorable!! Such a darling card! Lovely card, this Tilda is so cute! Thanks for joining us at SEME!